Kössen, in the centre of the Innsbruck – Salzburg – Munich - triangle, flanked by the rockfaces of the Emperor mountains and the gentle ridge of the Kitzbüheler Alps. The picturesque paintings on the facades of the houses in the quiet (reduced traffic!) village centre are a feast for the eyes. Kössen is the largest village in the Tyrolean area Kaiserwinkl and has much to offer all year round. Kössen is an ideal starting point for walks and mountain hikes. For the more adventurous tourists, how about the challenge of a rockclimbing tour, go for altitude on one of the many mountainbike tracks or look down on Kaiserwinkl from a birds eye view. The Kössen flight school offers basic courses for beginners, further training for pros and examinations for all Austrian and German licences. A tandem flight leaves you with an unforgettable memory of the feeling of free flying. For a real kick try an extreme sport like a rafting or canyoning. 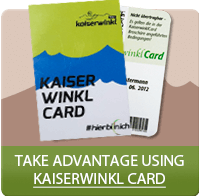 The Adventure Club Kaiserwinkl has many more cool activites on offer. Two noted 18-hole golf courses leave nothing to be desired. A further six golf courses are available within a 30km distance. The Adventure Forest Pool is equipped with slides, water mushroom, whirlpool, playground equipment and a large sunbathing lawn. Kössen and the Kaiserwinkl region have a big heart for little guests. There are special programs, game festivals, contests and events for the kids. Many destinations especially cater for families with children. Tyroleans know how to celebrate, which is proved by many festivals and traditional events which take place throughout the year. Highlights include the cheese festival, the Harley Davidson meet and the "bringing down the cows" festival. The Unterberg is the Nr. 1 skiing region in Kaiserwinkl. For skiers and snowboarders there are 10 lifts and 30 maintained kilometres of slopes available. A modern snow making system assures a lot of fun on the piste from November to April. Don't forget to stop by in one of the mountain huts for a drink! Skischool, ski-preschool and ski-hire are close to the Unterberg lifts. Kids enjoy learning to ski. They hardly notice they are learning, while having fun and games in the snow. In recent years Kössen and the Kaiserwinkl have turned into a first class cross-country ski region with a network of tracks totalling 140 km. The excellent preparation of the runs and skating tracks has been awarded with the Tyrolean cross-country seal of approval. Whoever is looking for an alternative to skiing or wants to enjoy the romantic aspect of winter, can explore the area with snow shoes, take a walk on one of the many cleared winter walking tracks or wrap up in warm blankets and enjoy a sleigh ride through the snowy landscape. Experience real winter party atmosphere tobogganing, ice curling, or snowtubing. Kössen in Tyrolean Kaiserwinkl makes winter dreams come true!